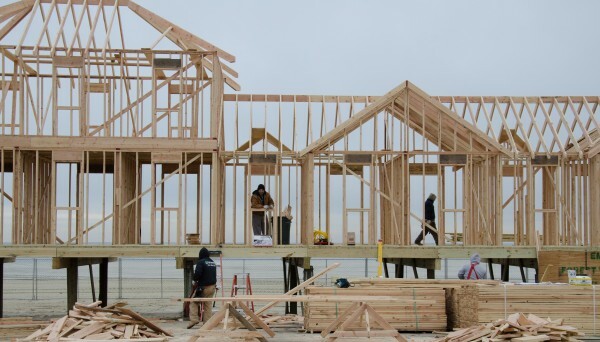 In June 2013, the Rebuild by Design competition was launched by the Hurricane Sandy Rebuilding Task Force and the U.S. Department of Housing and Urban Development to find innovative solutions to the vulnerabilities of the region that Sandy exposed. Initially 148 teams made up of planners, designers, engineers and scientists from around the world submitted ideas. Ultimately six projects were chosen, and in June, HUD awarded $920 million of disaster recovery funding to begin implementing them. Awarded $335 million, this project will build a protective system around Manhattan from West 57th Street south, around the Battery to East 42nd Street. 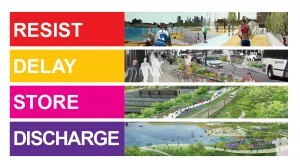 It will provide flood protection, and social and community benefits in various sections of the waterfront. 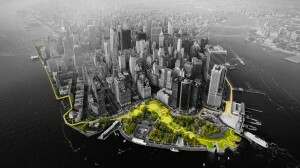 The plans include a berm or raised barrier to protect the Lower East Side from storm surges and rising sea levels; deployable walls that flip down under FDR Drive between the Manhattan Bridge and Montgomery Street in case of flooding; and the Battery Berm, an elevated path through the Battery. This effort to make Nassau County’s south shore more resilient was awarded $125 million. The multi-pronged approach includes protective infrastructure that stores, cleans and replenishes storm water; constructed marshes to reduce wave action, enhance the ecology and provide recreational opportunities; and green infrastructure to store and filter water and provide public space. Incorporating transportation, ecology and development solutions for the New Jersey Meadowlands, this project was awarded $150 million. The Meadowpark, a large natural reserve with berms and marshes, will protect against ocean surges, collect rainfall, reduce sewage overflows and provide recreational opportunities. The Meadowband, offering flood protection, will be comprised of a street, bus rapid transit and public spaces. Development, currently mostly single-story warehouses, will be rezoned to include multi-story residences. This comprehensive plan to protect Hoboken, Jersey City and Weehawken, N.J., from flooding and storm surges was awarded $230 million. It comprises hard infrastructure and soft landscaping to protect the coast and provide public spaces, green infrastructure to store and direct excess rainwater, water pumps and alternative drainage routes to discharge the water, and policy guidelines and recommendations. Awarded $20 million, this project will safeguard New York City’s food hub, which supplies food to 22 million people, from flooding. 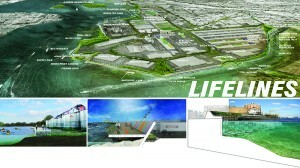 A waterfront greenway and new platforms will provide flood protection; the Levee Lab will be a place where innovative techniques for storm and flood protection can be explored. The plan will also create maritime emergency supply lines so that ships can transport food if roads are impassable, and a tri-generation plant for heating and refrigeration. This project, awarded $60 million, will protect Staten Island, which was badly damaged by Hurricane Sandy because of its location at the mouth of the New York Bight. Risk from storm surge, waves and erosion will be reduced through a layered system including a constructed “necklace of breakwaters” (rocky sloped walls placed in the water) along the south shore that can reduce wave heights by 4 feet and provide habitat for marine life. Exposed breakwaters will protect communities. 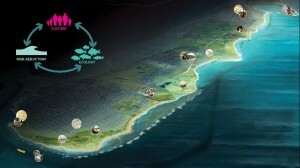 Sub-tidal breakwaters, which will protect parkland, will be “constructed reefs” which can slow shoreline erosion and, with their varied texture and niches, provide new habitat for marine creatures. Calming the waves will also serve to increase sedimentation, which replenishes beaches, and encourage more shoreline recreation. In addition, Living Breakwaters aims to restore the oyster beds that once supported a thriving industry in Raritan Bay. Oysters will filter and clean water, and their beds of layered shells will reinforce the breakwaters. The New York Harbor School, one of SCAPE’s partners, features a curriculum of estuary stewardship centered on oyster gardening. The school is also the production hub for The Billion Oyster Project, a long-term project to restore a billion oysters to the harbor and train thousands of students to be stewards of their local marine environment. Community members and stakeholders are involved in brainstorming designs and functions of “Water Hubs,” the on-land component of Living Breakwaters. To promote social resiliency, Water Hubs will offer space for people to gather, attend classes, dine and store equipment, and provide amenities like bathrooms and water fountains. Each hub will be shaped by its particular community’s needs. The project will require further design development with input from stakeholders—community activists, residents, environmental advocates, regulators and policy makers. In addition, physical and digital modeling are required as part of the design process to assess wave and erosion reduction, sedimentation and water quality, overall performance, evaluation and aesthetics. Construction will begin after the environmental review and designs are completed. A pilot project is planned for Tottenville to test a variety of breakwaters and a Water Hub. The pilot project will enable the team to gauge impacts and figure out how best to scale up the designs. 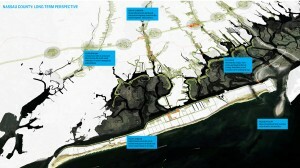 Because Living Breakwaters goes against conventional planning norms by integrating ecological, social and risk reduction goals, “This approach by its very nature exposes implementation hurdles and challenges, in particular the unknowns of underwater permitting and regulatory review,” explained Orff. Living Breakwaters will need to be physically feasible, as well as permittable and fundable within the complex political and regulatory milieu of New York Harbor. 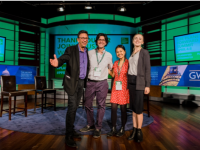 Klaus Jacob, special research scientist at the Earth Institute’s Lamont-Doherty Earth Observatory, served as an advisor for part of the Rebuild by Design competition. His role was to familiarize the teams with climate change and sea level rise forecasts, as well as the social and economic conditions of the region. “They don’t have the patience to look 50 to 100 years into the future,” he said. Jacob is concerned that in the end, the projects largely emphasize protection rather than adaptation or “strategic resettlement.” He explained that there are three fundamental options for adapting to rising sea levels and storm surges: protection against water, adaptation to water (learning to live with it), and strategic relocation. Strategic relocation can involve vertically raising structures in place or relocating them to higher ground. The latter, said Jacob, is the most sustainable and resilient option. 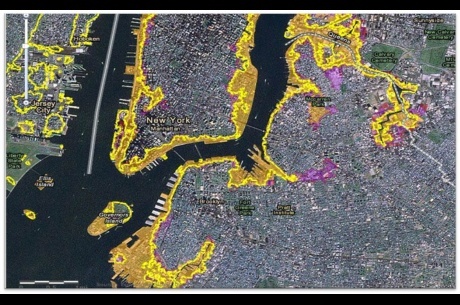 According to the New York City Panel on Climate Change (NPCC) report for 2013, mid-range projections for sea level rise in the 2050s are 11 to 24 inches; the high estimate is 31 inches. 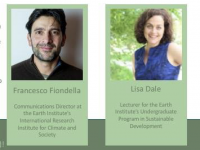 Cynthia Rosenzweig, co-chair of the NPCC, and a senior research scientist at the NASA Goddard Institute for Space Studies and Columbia University’s Earth Institute, and her team have just completed the NPCC 2015 report. While it acknowledges uncertainties, it projects a high end of sea level rise of up to 6 feet by 2100. 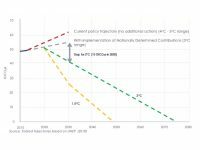 Rosenzweig explained that the NPCC projections for 2050 and 2100, which were provided to all the Rebuild by Design teams, were taken into consideration in the basic planning stages, and she feels strongly that the six teams need to incorporate the science from the NPCC as the projects progress. In addition, the NPCC emphasizes the need to utilize a portfolio of resiliency approaches, not just one. Rosenzweig explained that the various approaches include engineering solutions like flood barriers and berms; ecosystem strategies like breakwaters that provide habitat; and social programs. While the projects consulted with stakeholders and community members, she noted that they generally seem more focused on engineering and ecosystem strategies, with some emphasizing one aspect over the other. There are also social programs, she said, that could be incorporated into the projects, such as buddy systems for older people when a storm approaches, or insurance strategies. 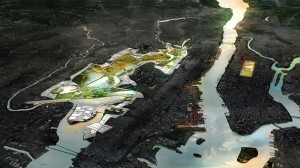 Ultimately, Rosenzweig would like to see a comprehensive metropolitan regional approach to the risks of climate change—an overarching perspective that links these iconic individual projects in different areas, addresses all stakeholder needs, and takes into consideration the challenges of the entire region.